Home/ITIL 4: update available from 28th of February. Discover our Webinar! ITIL 4: update available from 28th of February. Discover our Webinar! 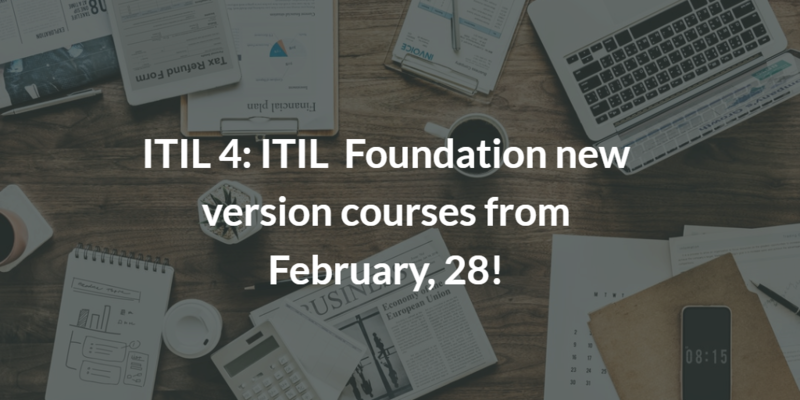 Just few days left for the launching of the new ITIL version, ITIL 4: the Foundation module of the new certification scheme will be available from the 28 of February. The update involved more than 2000 professionals with the aim of developing a framework which is agile and easy to apply. The ITIL v4 framework provides a comprehensive, practical and proven guidance expanding itself to the wider context of customer experience, value streams and digital transformation, as well as embracing new ways of working as Lean, Agile and DevOps. The framework has been developed to guarantee a flexible, coordinated and integrated system for the effective IT services governance and management. ITIL 4 Foundation will be the first module to be launched; the release of the further modules is scheduled for Q2 2019. Currently, the updated ITIL version is available only in English and as for the ITIL v3 scheme, the achievement of the ITIL Foundation module is a prerequisite to have access to the further modules. To know all the available dates and to discover the course objectives, click the link: ITIL 4 Foundation course. The update to the ITIL 4 version brings changes to the entire ITIL framework. In order to let you know all the news of ITIL 4 and the differences with the previous ITIL v3 version, we have prepared a webinar about the ITIL update. Our ITIL trainer, Kaïs Albassir, will explain how the update will impact the ITIL framework and will clarify all the likely doubts. The free webinar From ITIL v3 to ITIL 4: everything you need to know about the update takes place on March, 12. At the end of the webinar there will be an Q&A session with the trainer but if you miss the event, you will receive an email with the link to watch the registration of the webinar. ITIL v4 framework is built on established ITSM practices and expands itself to the wider context of customer experience, value streams and digital transformation, as well as embracing new ways of working. What changes from the old version? What to do with my ITIL credits? Subscribe to our free webinar and get all the information! Subscribe to the free webinar!